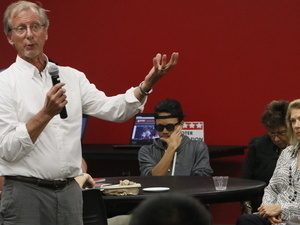 The Office of Civic Engagement has partnered with the J. Glenn Beall, Jr. Institute for Public Affairs, the Political Science Department, and the Student Government Association to host a series of town hall meetings each semester that brings students together for meaningful conversations about their local, state, and national governments. These conversations range in topics from how the economy affects our students and higher education, to issues regarding foreign policy. These programs are focused on educating students on the democratic process and how they can get involved to make a difference.